MANY may have forgotten that IOI Properties Bhd was and still is a heavyweight property developer in terms of size and profitability. Privatised in 2009, its last two financial years of 2011 and 2010 have seen the company steadily increasing its revenue base which now averages close to RM1bil. This is a 30% jump from the revenue recorded in 2009. For its year ended June 30, 2011 the company recorded sales value of RM942mil, a slight decrease from the RM1.04bil it recorded in the previous year. During its time as a listed entity, although revenue wasn't as high, it was one of the most profitable developers around. For the three financial years prior to its privatisation in 2009, the company was recording operating margins in property development segment of 48.8%, 56.4% and 53.3% respectively. Speculation is now rife that a re-listing of IOI Properties is something top management is mulling over. Investors may recall that IOI Properties was privatised in 2009 by IOI Corp Bhd at a price of RM2.60n per share. The company was privatised after its price began to languish, touching a seven-year low. Analysts at that time favoured the privatisation move, saying that IOI Corp got a good price at a valuation of 0.7 times its book value. The offer price of RM2.60 was at a substantial 34% discount to IOI Properties' net tangible value of RM3.95. Judging by the number of launches it will be making (approximately six next year), revenue looks set to top the RM1bil mark again for its financial year (FY) 2013. While executives of IOI Corp are mum on the privatisation issue, they are decidedly more than happy to talk about the property projects in the pipeline. IOI Properties will be kept extremely busy over the next two years. This is chiefly apparent with its latest forays into Singapore and its move to build more commercial buildings for recurring income purposes. Currently, recurring income contributes some 11% to IOI Properties revenue. With land prices having moved up significantly, and its townships in Puchong and IOI Resort City maturing, is IOI Properties' still confident on the Malaysian property outlook? “We are actually very optimistic. Based on our planned launches, both for residential and commercial, you will see that we are pretty confident of the demand we are likely to garner. The trend we see now is that there are a lot of parents buying houses for their children,” says IOI Properties Bhd senior general manager Lee Yoke Har. “Landbank is not just getting expensive, it is getting scarce. This is especially true in Klang Valley where there is not much landbank available. Location is important, and most of our landbank is on prime and central locations. These places will always see demand. As the scarcity becomes more pronounced, house prices will start to rise again,” says Lee. In Malaysia, it is planning launches in three key townships IOI Resort City Putrajaya, 16 Sierra, and IOI Vivo City. 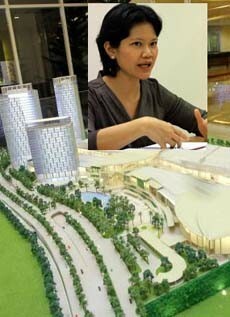 The company is working around the clock to complete the construction of its mall, the IOI City Mall in Putrajaya by 2014. This is something the management of IOI Properties is extremely excited about. “We will be signing with one anchor tenant and one key tenant next month for the mall. All in all, we will eventually be signing with four anchor tenants,” said Lee. “We are transforming IOI Resort City in Putrajaya to become a commercial and entertainment centre. Other than the new 18-hole golf course, a big part of the entertainment will come from the mall. We are planning for various activities for all age groups, but there is something special for the teenagers and young adults,” says Lee. Situated on 36 acres, besides the mall, there will also be two office blocks, and a hotel. The mall is scheduled to be completed in 2014 and the office towers a year later.IOI Properties plans to lease the mall and the office blocks to increase its recurring income. It will only sell the office block en-bloc. The key differentiation of the mall is its one-of its-kind entertainment park that has yet to be seen in any mall in the Klang Valley. The total gross development value for the commercial project is about RM2bil, with the mall taking up RM1bil. Featuring the Garden Mall concept with lots of alfresco dining, the IOI City Mall will have a net lettable area of 1.35 million sq ft, some 350 shops and 7,200 car parks. “The immediate target market is the 1.66 million residents living within a 20-minute drive who can reach the resort city easily from the KL-Seremban Highway and LDP,” says Lee. She adds that there are five universities near the IOI Resort City. It is also close to the various corporate training centres in Bangi. Right now, IOI City Mall's location is three minutes off the Kajang Toll along the KL Seremban highway and it is also connected to Kuala Lumpur City Centre via the Maju Expressway. “The other interchange, which has just received approval, is near the Malaysian Agricultural Research and Development Institute, which is diagonally opposite to us,” says Lee. Now, with all the major activity around the mall, it is only natural that it will need to be supported with more residential developments. The IOI Resort City township has been around since the 1990s. Its appeal has been the greenery and golf course in the area. Half of its condominium buyers are foreigners, many of whom are in Malaysia under the Malaysia My Second Home programme. “We are launching 120 condominium units with a view of the golf course.The development will come with clubhouse facilities. One can have both the resort ambience and city conveniences all at his doorstep,” she says. While the price has yet to be decided, Lee says the price of condominiums in IOI Resort City has been steadily increasing from RM300 per sq ft to about RM550 per sq ft. Meanwhile, closer to the southern part of Puchong, but still near Cyberjaya and Putrajaya, is IOI Properties' other township, 16 Sierra. This 530-acre township will also see upcoming launches which boasts of 16 different themed gardens for each phase and a private clubhouse. The themed gardens called The Ark, Tic-Tac-Toe, Algebra Garden and Peek-A-Boo among others, are designed with nature in mind. Residents of 16 Sierra will have access to all 16 themed gardens which will be interconnected via jogging paths and walkways. “So far, three gardens are complete. One of them being the 7.2-acre Central Park, while the other two are neighbourhood gardens within the residential precincts. We have just handed over one precinct together with the garden,” says Lee. She says some of the launches being lined up include semi detached houses and superlink houses. “Each new phase gets better than the previous one. You think you've seen the best, but the best is yet to come,” says Lee. Currently, 16 Sierra is linked to several highway networks via Damansara-Puchong Highway (LDP) and the newly extended South Klang Valley Expressway (SKVE). It can be reached directly via the extended SKVE from Puchong, Seri Kembangan, Kajang, Putrajaya and Cyberjaya. IOI Properties has been largely been responsible for Puchong's commercial success. With a ready population catchment of some 600,000, IOI Properties is looking to offer more through its undeveloped parcels of land. One of them is the 80-acre IOI Vivo City development. Infrastructure construction of Phase 1 which consists of about seven acres, will start by year-end. The seven acres will consist of a retail component, shop offices, office suites and suite apartments. It will also have a green concept. “Previously in Puchong, the commercial and residential component have always been spread out and separated. But today, the people want convenience. We see demand where commercial activities are within the immediate vicinity of the residential components yet with separate accesses and buffered with dense landscaping. “The commercial components will be connected via retail streets which make up the neighbourhood retail centre in Puchong. It will be a retail centre unlike the IOI Mall. The new neighbourhood centre will have a heavy focus on themed food and beverage outlets with landscaping and lots of offerings for the young adults. IOI Vivo City will be the next pulse of Puchong,” she says. Apart from IOI Vivo City, there will be two other big launches next year. The first is townhouses and condominiums in Puteri Hills while the second are condominiums in Bandar Puchong Jaya. A total of 640 units of service apartments called Skypod and 1,000 units of condominiums called The Skyz will be separately launched in Bandar Puchong Jaya. These launches is an indication of the company's confidence in that area. “Location is an extremely important factor in determining demand. We feel that our properties are located in existing areas that are already thriving with ready built infrastructure. Furthermore, these units will have unique features targeted at different segments of the market. The Skyz will be located on the highest point in Puchong. There will be beautiful skylines of Petaling Jaya, Shah Alam and Kuala Lumpur. Serviced apartments Skypods are targeted at yuppies and young families with an emphasis on high tech living. It will sit on two storeys of retail podium. The Puchong Financial Commercial Centre, which encompasses some 8 acres is anticipated to be Puchong's corporate and financial hub. Location wise, it is a 3-minute walk to the nearest proposed LRT station and fronts the LDP. The PFCC has five towers, two blocks which are already 60% and 40% occupied. One of the 2 completed towers is expected to receive its MSC Cybercentre status soon. The 12-storey Tower 1 has a net lettable area of 124,831 sq ft and has secured a university tenancy which takes up 60% of the floor space. Meanwhile, the 20-storey Tower 2, with a net lettable area of 253,212 sq ft has secured tenancy from a telco company and an oil and gas company. The buildings have state-of-the-art commercial features such as high speed voice and data facilities. Lee says IOI Properties is now making an application to seek MSC Malaysia Cybercentre status from the Multimedia Development Corporation for PFCC. “We want to appeal more to the IT-based and multinational companies since Cyberjaya is just a 15-minute drive away. Currently, there are less than 10 buildings in the Klang valley with the MSC status,” says Lee. Lee says while many people feel that land prices in Singapore are already high, the issue of scarcity on the island state has been more pressing. Hence, the group is confident about the long term prospects of their projects. “The government of Singapore has been very proactive in managing their economy. It is rare for a developed economy to continue growing at the pace of a developing economy. We feel that with the unique macroeconomic factors there, coupled with the scarcity and value of the land, property will continue to do well,” says Lee. She says construction for South Beach, a mixed use development on Singapore's Beach Road, has started, and is on track to be completed by 2015. South Beach is IOI Properties' third foray into the city state, which now includes its joint venture with Singapore's Ho Bee Group for two condominium developments in Sentosa Cove and the development of a condominium project in Mergui Road with another local joint venture partner. IOI Corp has a 49.9% interest in the South Beach project through a restructuring exercise. The 51.1% shareholder of South Beach is City Developments. In total, IOI paid S$317mil (RM761mil) for its stake and expects to contribute further equity in proportion to its respective shareholding for the said project. The land is located between Raffles Hotel and Suntec City and is next to the Esplanade MRT station. The total land area is 376,295 sq ft and has a leasehold tenure of 99 years. It will have some 188 apartments, 705 hotel rooms, 529,013 sq ft of office space and 77,726 sq ft of retail space. Lee saysthe hotel and office portion are to be leased..
More recently, IOI Corp successfully tendered for a parcel of land in Jalan Lempeng, off Clementi Avenue 6 in Singapore, for S$408 million (RM995 million). The Housing and Development Board of Singapore accepted the bid from Multi Wealth (Singapore) Pte Ltd, in which IOI Corp holds a 99.8%-owned subsidiary. That piece of land will be used to build condominiums. It is within walking distance of the Clementi Mass Rapid Transit station and the Clementi bus interchange. The 99-year leasehold parcel of land measures about 2.4ha with a permissible gross floor area of 736,000 sq ft, which translates into a plot ratio of 2.8. “The gross development value and gross development costs of the proposed development have yet to be determined. We have started planning now and should come up with a plan by year end.” says Lee. This project comes at a time when the Singaporean government has effected an additional 10% stamp duty on foreigners buying private property in Singapore. Lee says that the Clementi project is wholly residential and targeted at the local market. Im interested to invest for this. Any info on The Skyz?? I'd tried to find on website, but only limited info. Or is it just rumours? ?